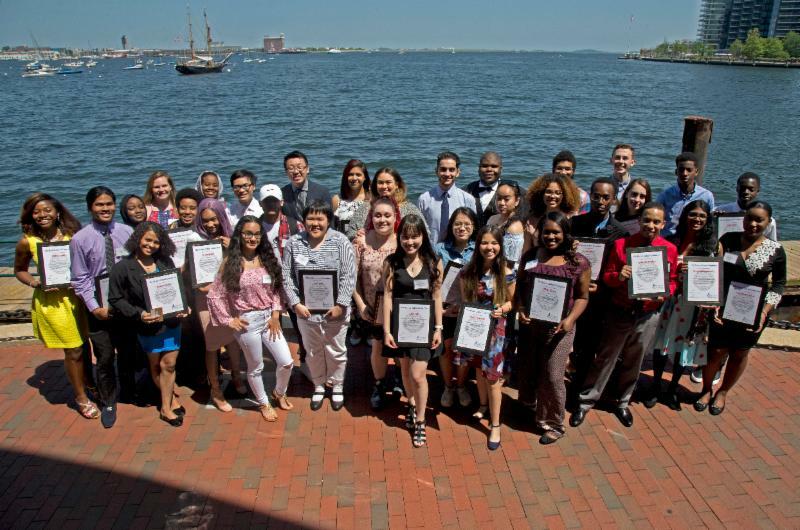 BOSTON — Wednesday, May 30, 2018 — Thirty-six high school valedictorians from the Boston Public Schools (BPS) were honored yesterday at the 20th Annual BPS Valedictorians Luncheon at the Boston Harbor Hotel. Mayor Martin J. Walsh, Boston School Committee Chairperson Michael Loconto, and BPS Superintendent Tommy Chang recognized the valedictorians for their incredible accomplishments during a ceremony emceed by WGBH television and radio host and commentator Callie Crossley. This year’s valedictorians were born in ten different countries. Nearly half of the valedictorians are “home grown” BPS students, or have attended BPS schools from kindergarten through 12th grade. Forty-two percent were born outside the US. Another 47% will be the first in their families to attend college. The Boston Foundation, Eastern Bank, Shah Family Foundation, and Steward Health Care were the major sponsors of the ceremony. Any proceeds will benefit the City of Boston Scholarship Fund. Tyler Luong of Boston Arts Academy (BAA) provided this year’s valedictorian’s address. The BPS Valedictorians Luncheon was first held at the Parkman House in 1999. Its success has enabled the event to grow to a larger venue to include BPS families, staff, and partners from Boston’s higher education, business, and philanthropic communities. Christopher is a reflective and focused young man whose humility and down-to-earth nature belie his academic gifts and unshakeable work habits. He is an effective communicator with a curious mind. This fall, Christopher will attend UMass Lowell where he will be the first person in his family to attend college. Djine moved to the United States from Haiti just two years ago. She quickly found a new home at BATA, where she has persevered and grown in her academic capabilities and her self-confidence. Djine will attend UMass Boston where she will be the first person in her family to attend college. She plans to pursue a career in nursing. ﻿Tyler was born and raised in Boston and has spent his entire academic career in the Boston Public Schools. He is a talented pianist whose passion for the arts has served him well as the top student at Boston Arts Academy. Both of Tyler’s sisters are alums of BAA, and his sister Luna was BAA’s valedictorian in 2014. Tyler has earned a Posse Scholarship to Bucknell University. Bismary emigrated from the Dominican Republic just two years before arriving at BCLA. Bismary persevered and has since earned a proficiency level of 5.1 out of 6 on the state English Language Proficiency test. She enjoys tennis, volleyball, and dance, and is an avid reader. Bismary’s hard work and determination has earned her a full scholarship to Northeastern University. Tania struggled at her previous high school before finding a home at BDEA, where she graduated last April with a perfect 4.0 GPA! Last year, she participated in an internship at Vertex Pharmaceuticals and will do so again this coming summer. This fall, she will study molecular biology at Bryn Mawr College, where she has earned a Posse Scholarship. Alex emigrated from Uzbekistan in 2015 with a minimal understanding of English. After spending a year in UMass Boston’s intensive ESL program, Alex enrolled at Boston Green Academy and has become an integral part of the BGA community. He was a driving force behind the BGA community garden, which ultimately earned him the BIDMC Environmental Champion Student Award. Alex will attend Northeastern University and plans to pursue a career in environmental sustainability. Ardit emigrated with his family from Albania 2015. When he’s not doing school work, Ardit enjoys learning Romanian and reading facts about other countries. He plans to pursue a career in computer science because he believes that technology helps him better understand the world around him. Ardit is headed to UMass Lowell, where he will be the first person in his family to attend college. Ambria Coakley is not only an impressive scholar, but a truly exemplary student leader within the BLA community. Ambria has a passion for sciences, which was reinforced through courses like AP biology, and through her internship experience through Project Success at Harvard Medical School. She aspires to become a doctor and supply medical care to those who need it most, perhaps through Doctors Without Borders. Ambria is elated to be attending Spelman College in the fall, where she will study pre-med. Jonathan is an A+ student who has challenged himself with an overload of AP courses, excelling in all of them. He has a passion for the classics, and competes in classical competitions that test his knowledge of Latin and mythology. Jonathan is also a dedicated musician who plays both the tuba and the piano. This talented young man will continue his studies at Harvard University. Originally from Cape Verde, Lea lives in the South End with her grandmother while her mother resides in Cape Verde working long hours to provide for the family. Lea is a member of the National Honor Society, Debate Team, Robotics Team, and Math Club, and has fulfilled many hours of community service. As a recipient of the Posse Scholarship, Lea will attend Hamilton College where she plans to major in biology and pursue a career in medical research. Mahamud was born is Somalia and immigrated to the United States with his family when he was just 7 months old. Mahamud found learning English as a second language extremely difficult, but through hard work, he learned to read, speak, and write English by the second grade. Mahamud plans to major in business management when he attends Bentley University this fall. His long-term goal is to start his own business. Born and raised in New York, Sydney has earned high honors during her three years at Charlestown High. She is a recipient of the Dartmouth Book Award and has completed courses at Wheelock College through the Noonan Scholars program. Sydney’s teachers describe her as a powerhouse ready to change the world with her passion for social justice. Sydney has earned a full academic scholarship to Bowdoin College in Maine. Vince is an amazing young man who manages to do well in school, hold down a part-time job, and volunteer with a youth soccer team in his community on the weekends. Vince will be the first in his family to attend college when he continues his studies next fall at Bunker Hill Community College. The child of El Salvadoran immigrants, Aleida has spent her entire academic career in the Boston Public Schools. In addition to her dedication to her studies, she is a committed member of the Build On service learning program, and the One Goal Program. Aleida is a proud recipient of the John and Abigail Adams Scholarship. She will attend UMass Amherst. Mario moved to Boston from Cape Verde in middle school. His teachers describe Mario Lopes as a humble, family oriented young man who is always smiling and helping his classmates. His passions are math, computer science, and soccer. He will attend UMass Dartmouth this fall. Brandon has been a shining star at Dorchester Academy. His teachers describe him as a role model who consistently puts forth true spirit of caring and motivation to help others. They also say his smile can light up a room. Brandon is already a student at Benjamin Franklin Institute of Technology, where he is the first person in his family to attend college. With a weighted GPA of 5.73, Ooviya still finds time for extracurricular activities. She is president of the National Honor Society, an actress and artist with the Theater Society, a mathlete, and editor for the Art Room Poetry Journal. Ooviya will spend the summer working as a programmer for eResearch Technology in Charlestown before heading to Brown University. Naby embodies The English High School’s motto of Honor, Achievement and Service to Mankind. In a society that too often treats these virtues as unrealistic or somewhat dated, Naby continuously reaffirms that the high standards we place on our students are not only attainable, but should serve as a mere starting point. Naby has made a manful decision to lift up his fellow classmates as part of his journey. Next year, Naby will attend Northeastern University on a full scholarship. Driven and unassuming, with a thirst for knowledge, Vy is a self-motivated, confident, and competent young lady. Last year, she led her JROTC Academic JV Squad to a first-place finish in her Boston citywide scholastic competition. Vy has also earned a full scholarship to Northeastern University, where she plans to study science or medicine. Robert is known as “the Professor” at Fenway High School, where he is a role model and leader. He is a former special education student who has an impeccable work ethic. Robert seeks challenges wherever he can find them – through the Debate League, through summer classes at Harvard, and through his many internships. Robert will continue challenging himself at the College of the Holy Cross. Raised by a single mother, Kaysia was diagnosed with pulmonary hypertension when she was 8 years old. Kaysia was determined not to let her illness slow her down, and she successfully completed high school in just three years. Her ultimate plans are to either become a neonatal nurse practitioner or an elementary school teacher. Her next stop is Bunker Hill Community College. Raised by his single father, Kanbe has lived his entire life beating expectations. At the Henderson, Kanbe gained a prominent reputation among faculty and students alike where he served as a co-captain of the Debate Team, played intramural sports, was a member of the Travel Writing Club, won a city wide art contest, and served as the president of Strong Men, Strong Leaders, a character building organization for young men of color. Kanbe is the Henderson School's first Posse Scholar, and will attend Centre College in the fall, where he plans to study nursing. Erisette has been a student at the Horace Mann School since the age of 6. In addition to being gifted academically, she is also a strong leader, excelling in everything she sets out to do. She has been a valued member of the basketball team, student government president, and is always the friendliest person in the room. Erisette will continue her educational journey at Gallaudet University in Washington, D.C., where she plans to pursue a degree in special education. Carlia is a bright young woman with a passion for science. She has been a part of Crimson Summer Academy for 4 years. While part of the Vertex Science Fair Mentorship Program, her team designed a pair of glasses that would accurately measure the dimensions of someone's face to give them a better fitting pair of glasses. Carlia has earned a full scholarship to Northeastern University, where she plans to study biomedical engineering. Born in Abu-Dhabi, Aya is one of seven children who moved to the US with her family five years ago. Aya has already earned college credits through a dual enrollment program, and has received a full scholarship to Wellesley College. She loves helping people and plans to become a doctor. Ardo has excelled as a radio and television broadcasting student at the city’s only technical vocational school. She enjoys visual media production, where she can harness the power of storytelling to bring about social and economic change. Ardo has earned 18 college credits through RoxMapp, a program that ensures that all students have the support, experience, and preparation needed to access a high-demand career and post-secondary pathway. Ardo will attend Bucknell University as a Posse Scholar, where she plans to pursue a degree in international relations and business. Maryssa is a scholar, an athlete, and an artist. She is an avid runner who has been involved in the Sole Train therapeutic running group. She has also worked with Skanska Construction on the joint mural project between Skanska and the McKinley. This triple threat is headed to Bunker Hill Community College. Francesca, better known as “Frankie” at school, is one of a set of triplets. Who has worked hard to overcome personal struggles to graduate. Francesca has developed self-confidence and has learned to persevere when faced with new and challenging obstacles - skills she has learned in part from her idol, Maya Angelou. Frankie will attend Lasell College as a fashion design major. Amy is a proud graduate of the Rafael Hernández K-8 School. At Muñiz Academy, she has been a member of Harvard Crimson Summer Academy, the Yearbook Committee, Student Government, the Peer Leaders program, and the volleyball team. Amy also teaches at the after school program at the Hurley K-8 School. She will be the first person in her family to attend college when she enters Wesleyan University this fall. Filomena moved to the US from Cape Verde at the age of 10. Her family battled language and financial issues, but her dogged determination, wit, and perseverance have allowed her to climb to the top of her class. Next year, she will continue her studies at Dartmouth College. She plans to later study law in order to become an immigration lawyer. She hopes to give a voice to the voiceless. Uyen immigrated to the US with her family from Vietnam in 2008. At the O’Bryant, she serves as the president at her school recycling club while juggling a challenging an array of AP courses. She is also an active member of her Vietnamese community, where she volunteers and translates every weekend at her local food pantry. The first in her family to go to college, she will be attending Tufts University with a full scholarship. Judy has balanced her academics at the Quincy’s International Baccalaureate Program and with a boatload of extracurricular activities, including basketball, Art Club, Piano Club, and Robotics Club. Last summer, Judy represented Quincy Upper at the IB Student World Conference in London. In the fall, Judy will attend Northeastern University as a Valedictorian Scholar with a focus on STEM. Kathryn is an avid rower who has spent the last 4 years participating in Row Boston, a rowing program available to all BPS students. She also took advantage of Snowden’s International Baccalaureate Program, and is slated to receive her IB Diploma this summer. Lucky for us, Kathryn isn’t going far. She has earned a full scholarship to Northeastern University. Born in Haiti, Alisha came to the US when she was 3 and attended the Chittick for Elementary School. She says she just always knew that working hard will allow her to get very far. At TechBoston, she is involved in student government and athletics and is a known leader throughout the building. Alisha has an amazingly positive attitude and a permanent smile on her face. Alisha will study at Northeastern University. Steeven’s family moved to Boston after the earthquake in Haiti in 2011. He credits his mother’s determination to support his family with giving him the motivation to do well in school. He says he is grateful for the opportunities that he has been given and is mindful of the countless people in Haiti who do not have access to such opportunities. Steeven will continue his journey at Dartmouth College. Originally from Albania, Pamela has excelled in every area of school life. She continuously extends herself to be of assistance to other students, helping classmates with MCAS prep, and serving as an ESL and Math tutor. Pamela will continue her studies this fall, also at Northeastern University.